Bull Run Christmas Lights, officially named the Bull Run Festival of Lights, is a 2.5-mile drive-through holiday light show combined holiday village and carnival at Northern Virginia's popular Bull Run Regional Park. 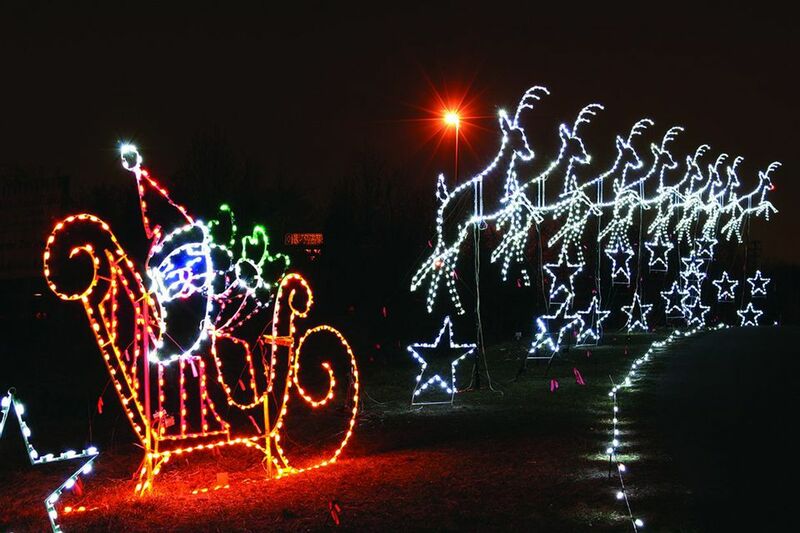 The seasonal light display features 40,000 animated lights set to music with displays including penguins, snowmen, candy canes, jumping deer, Santa’s workshop, Frosty the Snowman, tin soldiers, elves and Santa. After viewing the lights, families enjoy visiting the Winter Wonderland Holiday Village that includes amusement rides, an ice skating rink, entertainment, shopping, contests, food, and more. Please see the schedule below and be sure to note that the carnival dates are slightly different than the light display. This is a great place to take the whole family during the holiday season. The park is located in Fairfax County, VA just off of Interstate 66 in Centreville, on Rt. 29 (Lee Highway). It is located approximately 35 miles west of Washington, D.C. near the Manassas National Battlefield Park. Festival of Lights: November 21, 2018 - January 6, 2019. Hours: Monday - Thursday & Sunday: 5:30 to 9:30 p.m., Fridays, Saturdays & holidays: 5:30 to 10 p.m. Village and Carnival: November 29, 2018 - December 2, 2018 and December 6, 2018 - December 30, 2018. Hours: 5:30-9:30 p.m. Monday - Thursday, 5:30-10 p.m. Friday-Sunday and Holidays. Santa will be at the Village until December 23. Snowflake Stampede: - Saturday, November 17, 2018, 5:30 p.m. Enjoy a 2.5 mile fun run or walk and a special preview of the Festival of Lights on foot, and take a picture with your favorite display. The event is limited to the first 1,000 registrants.! Tickets will go on sale in September via www.ticketfly.com. All participants will receive a long-sleeve Snowflake Stampede T-shirt and glow necklace. Strollers are welcome. At the end of the walk, a shuttle bus will bring you back to your car. Bull Run Regional Park is one of Northern Virginia's most popular parks and is operated by the Northern Virginia Regional Park Authority (NOVA Parks). Bull Run is home to Atlantis Waterpark and offers hiking and equestrian trails. camping, soccer fields, playgrounds and access to the Occoquan Water Trail. This region offers great opportunities to enjoy outdoor recreation. NOVA Parks represents three counties and three cities — Arlington County, Fairfax County, Loudoun County, the City of Alexandria, the City of Falls Church and the City of Fairfax. For more information about the beautiful parks in this region, see a Guide to Parks in Northern Virginia. Northern Virginia is a wonderful place to celebrate the holidays, with a wide range of events for the whole family. See a Guide to Christmas in Northern Virginia.